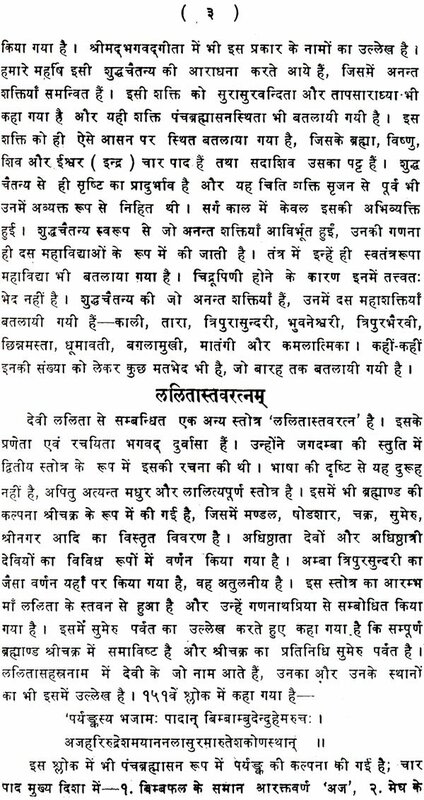 Just as Veda Vyasa has placed the Bhagavad Gita which is the quintessence of the Upanishads in the heart of the Mahabharata,. 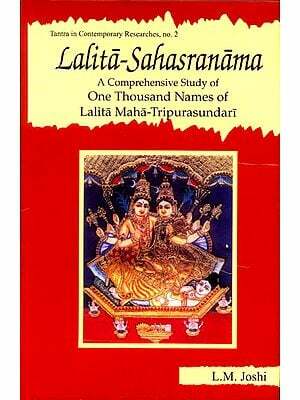 he has placed the Lalita Sahasranama which is the quintessence of the Mantra Shastra in the heart of the Brahmanda Purana. 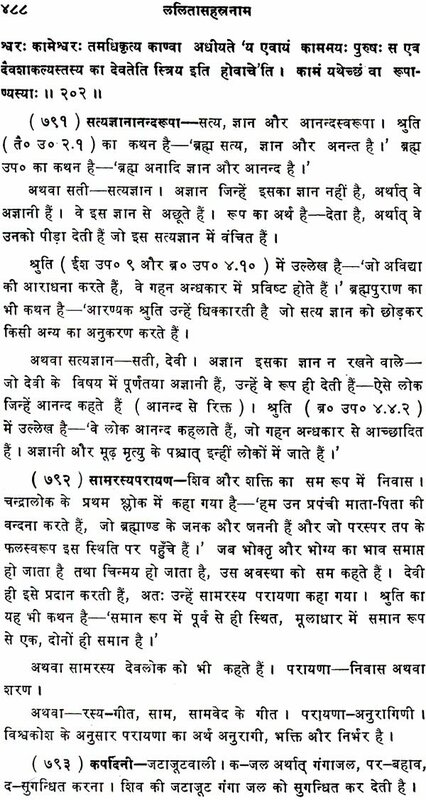 It occupies the same important place and enjoys the same popularity in the field of Sri Vidya as does the Bhagavad Gita in the field of Brahma Yidya or Vedanta. Of all the Bhashyas or commentaries that have helped to popularise it, the one written by Bhasurananda Natha, more familiarly known as Bhaskara Roya is the one most widely known. 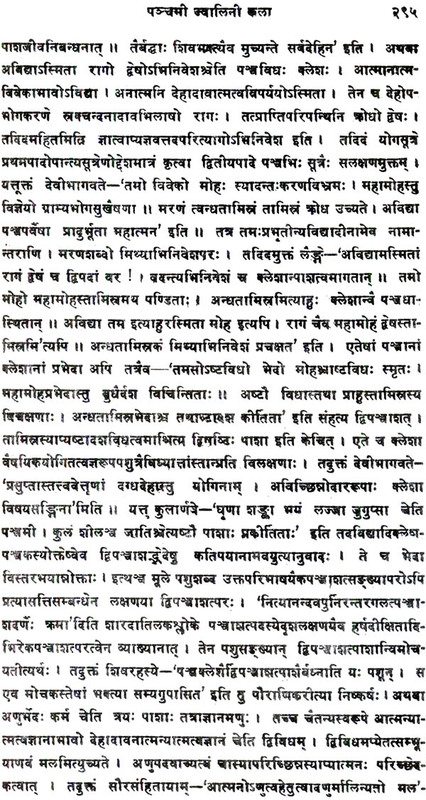 The other Bhashyas, not yet available in print, are said to be by Vidyaranya Muniswara, Vitnarsanandanatha and Bhattanarayana. 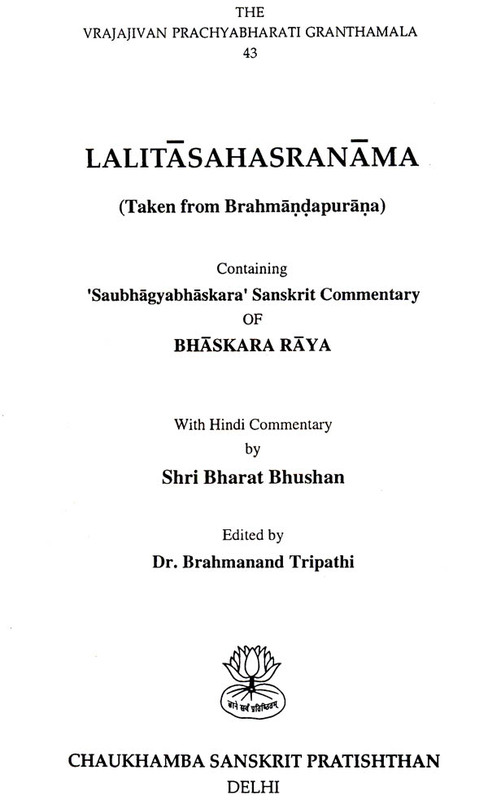 Bhaskara Raya lived from 1690 to 1785 A. D. Among his .works, the Saubhagya Bhaskara (Lalita Sahasranama Bhashya) Varivasya Rahasya (a treatise on Panchadashakshari and Setu Bandha (a commentary on Nitya Shodasikarnava) constitute, as it were, the Prasthana Traya of Sri Vidya. Bhaskara Roya was born in Maharastra. He migrated to Tanjore, won the esteem of the rulers of the place and settled down at a place near Tiruvalangadu on the banks of the Cauvery, where lived his Guru, Gangadhara Vajapeyi. This is the place now known as Bhaskararajapuram. 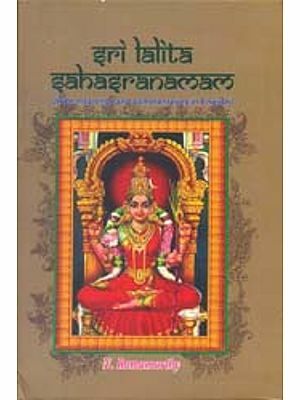 This Sahasranama was originally composed by the deities presiding over speech at the command of the Divine Mother herself in an assembly of gods. After listening to it, the Mohter said “Let one formally worship me or not, let one repeat the Sri Vidya or not, but let a devotee never miss the chanting of this Sahasranama.” It is ceclared that its chanting will cure diseases, will grant the fulfillment of chesrished desires and endow the devotee with long life. If one is bathed in water consecrated by its repetition, it will free one from all afflictions. A writer in the Vedanta Keshari observes: “ The claim made in the Phalasruti that this Hymn is unique one is not really an exaggeration (Anena sadrisam stotram, na bhutam na bhavishyati.) 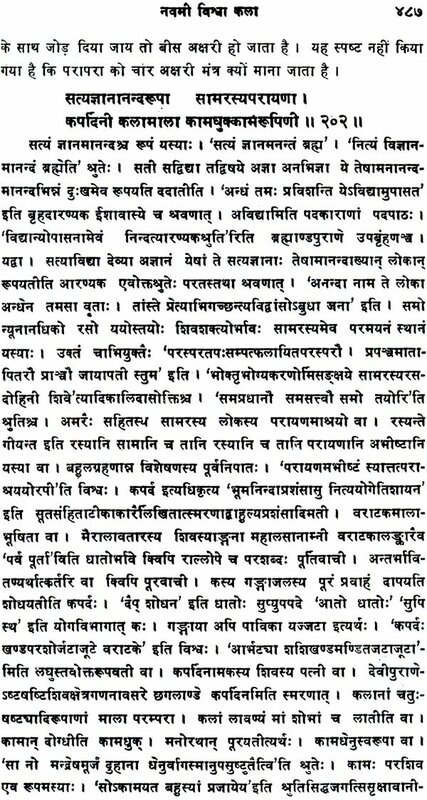 There is no mental complex or psychic confusion which is not removed by chanting this hymn (Yat Papam Jayate pumsam, tat Sarvam nashyati dhruvam). 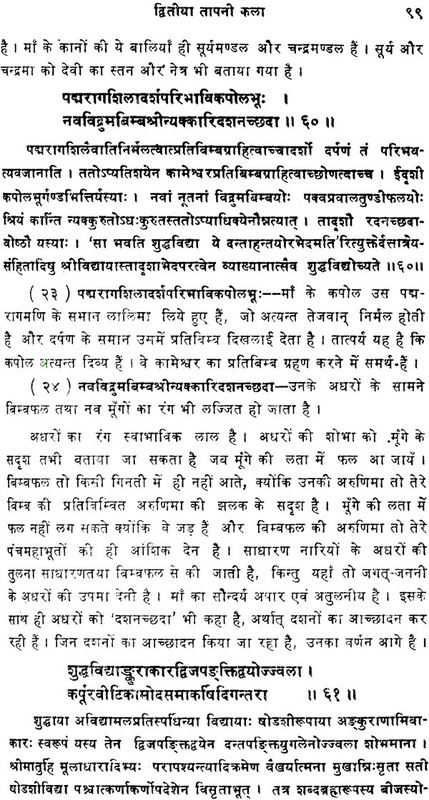 It may be odserved that persons chanting this hymn need not concentrate like those doing Japa. Even If their mind is wandering (and the minds of persons suffering form psychic confusion are always found to be wandering), the effect of chanting will not in any way be diminished, for it works on the unconscious mind directly”. 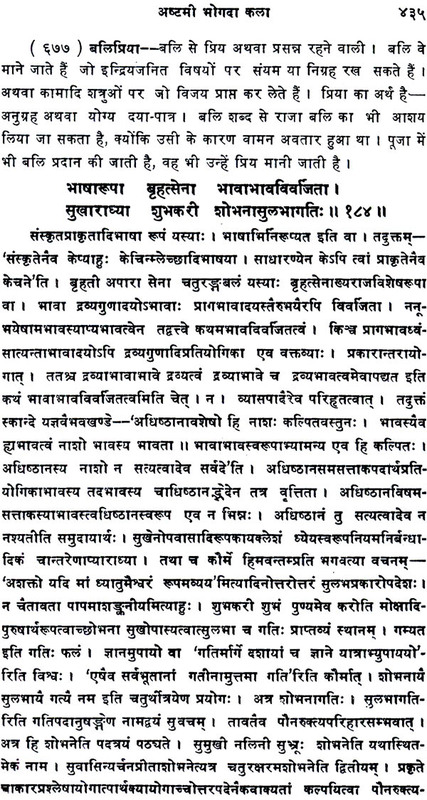 If a worshipper invokes the Devi by particular names, such as Kamadayini (fulfiller of desires), Annada (giver of food), Vasuda (give of wealth), Sarva Vyadhi Prashmaamani (destroyer of all diseases), Shivajanana Pradayini (Besto3wer of the knowledge of Shiva), the results corresponding to the ideas signified by the names will accrue to him. If one is altogether free form desires and chants the Sahasranama, as a mere act of devotion, one will have unalloyed bliss and attain freedom form the bondages of life. These are not simple ordinary names but every name is a Mantra and the whole series is a Mala Mantra, The chanting is considered to be specially efficacious on Fridays, on Navami, Chaturdashi, and full Moon and during the nine days to Navaratri. 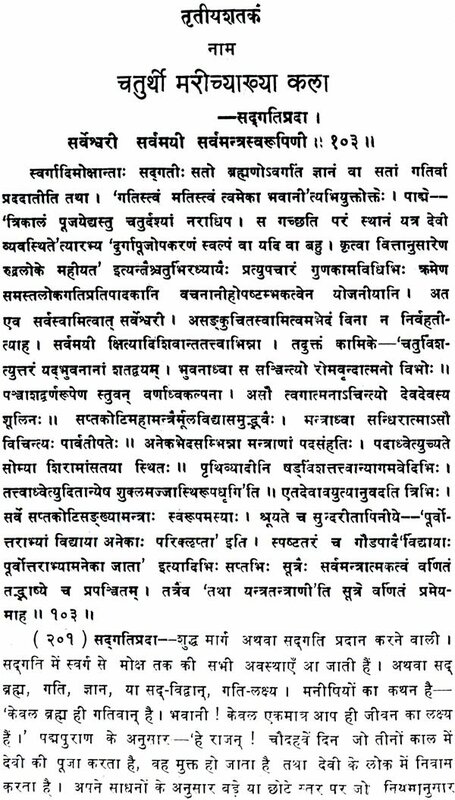 The Story of her Avatara is this: When Kamadeva had been burnt into ashes by the flah of anger from Siva's third eye the Devas pitied him and putting together his ashes in a human form they prayed to Siva the he should be revived.The form then came to life but it was not Kamadeva. It was Bhandasura, the very reverse of Kama, terrible in body and mind. He made men as well as gods lose their Veerya and the life of every one miserable. He built an empire with Sonitapura as his capital and persecuted the Devas. 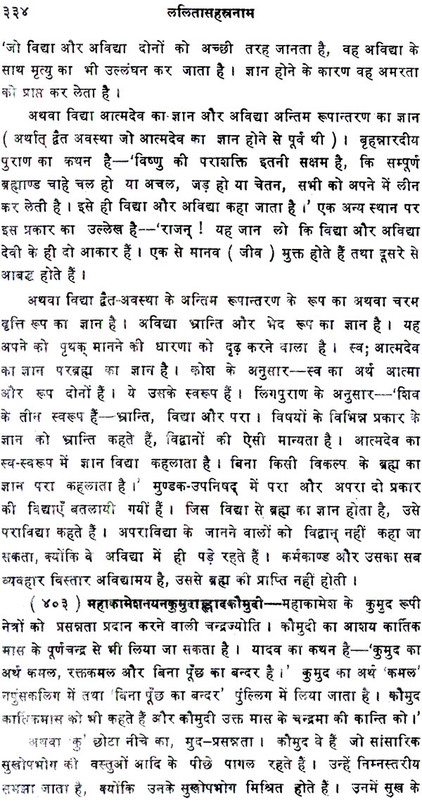 Narada advised Devendra did so and performed a sacrifice. From the sacrificial fire,. 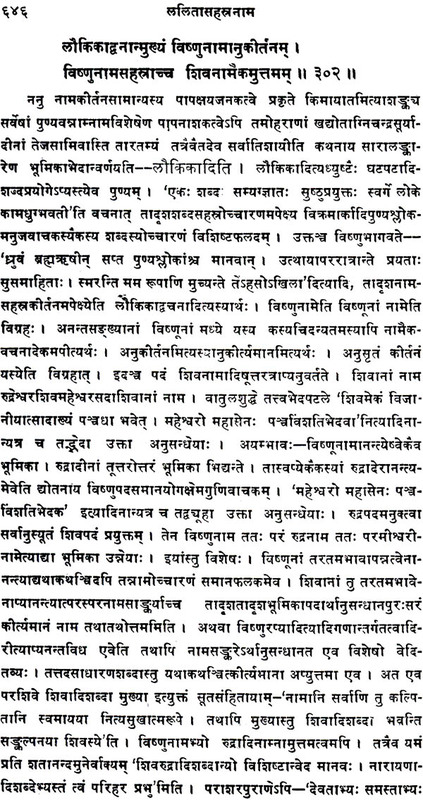 Arose Lalita Maha Tripura Sundari (Chida-gnikundasambhuta, Devakarya Samudyata.) The Devas celbrated Her wedding with Parameshwara and one the union of Shiva and Shakit, the whole world became filled with joy. After the union, Kamadeva came to life again through the grace of the Mother (Kamasanjivanaushadhih) though in a form unseen by others. A palace for the Mother was built by the gods on the top of Maha Meru. 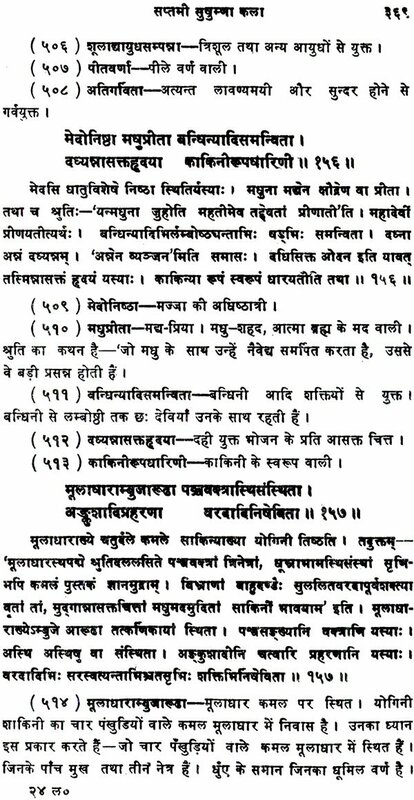 In due course, She led her forces against Bhandasura and destroyed him (Kameshwarastra Sandagdha, Sabgabdasyrasynayaka). 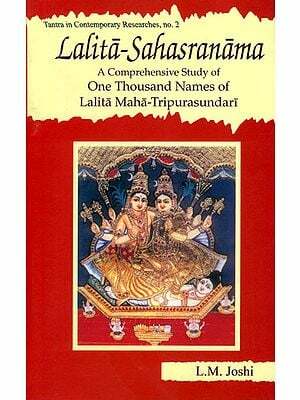 Such is not known in the northern parts of the country of Sri Lalitasahasranama which is the' key to the pure Tantra Sadhana of the Divine Mother. 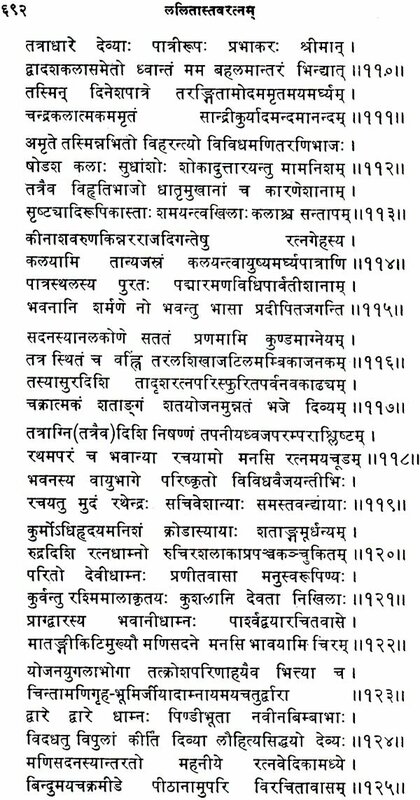 Thanks to the efforts of adapts like Sri Bhaskara Raya, the deeper import of what is appa- rently a poem of laudation, has been preserved and handed down the ages toa grateful posterity in the southern peninsula. For this inspired- work has many dynamic sides: spiritual, occu It, religious, literary and therapeutic. Each of the thousand Names in this Invocation is a mantra of profound potency. Only an Upasaka, practitioner, can speak authentically of the sanctifying and delivering power of the stotra. 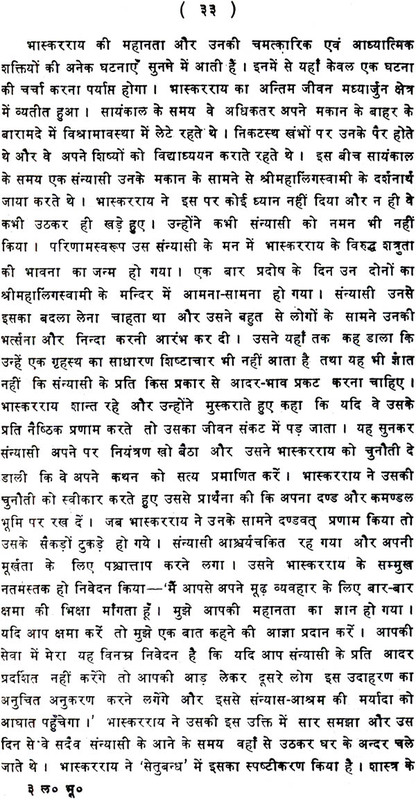 Of these fortunate few, Sri Bharat Bhushan, the author' of the present work is certainly one. 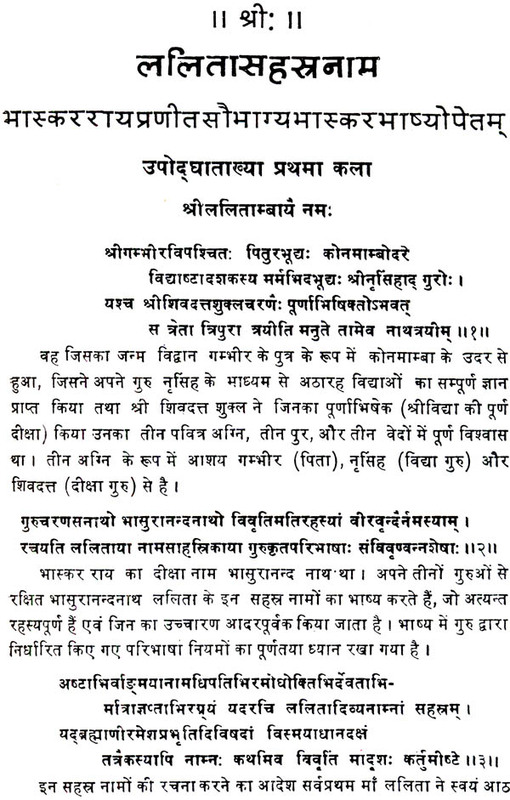 On him has fallen the honour of introducing this great treatise to the Hindi-speaking world. His presentation of this eulogy of the Divine Creatress is -rernarkable for its scholar- ship, depth of vision, intensity of aspiration and what is more important, his evident eagerness to share his intimate experience of the Grace of the Mother with the readers. He has studied all available allied literature on the subject and his understanding is comprehensive. 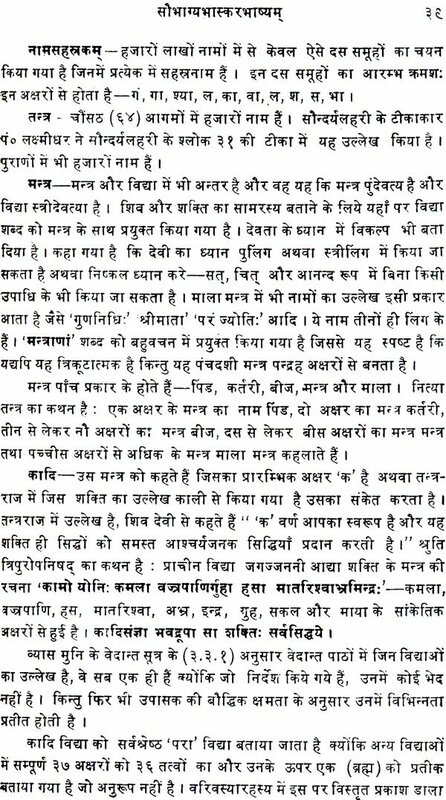 To him this labour of preparing a Hindi edition of the Sanskrit classic has been a sadhana of the soul and he richly deserves all the bounty that the empress of the Universe is showering on him. Doubtless every sincere reader of this work will receive something of this divine largesse.